The kids are going back to school, and parents are finally getting enough sleep to think about having some fun. Here&apos;s a list of the goings-on this August to help fill your newfound free time! Hop on & off at any of the designated stops. It’s free! The Farmer’s Market is sponsored by the St. Charles Lions Club and is open Saturday mornings through October 27. Vendors will be selling fresh produce, vegetables, plants, jams/jelly, honey, and much more. While there, stop in the Foundry Art Centre and explore their exhibits. It’s Missouri’s birthday and you’re invited! Come help celebrate the 197th anniversary of Missouri becoming a state. Enjoy the World Bird Sanctuary “Raptor Awareness” program at 1 PM along with other special demonstrations and programs. The public is invited to the open house to view the buildings where our first legislators and senators met from 1821-1826 and learn about Missouri’s road to statehood. Plus there will be free birthday cake. Tap your toes, dance along, or just sit back and relax to music covering the 1930s to 1990s. Bring your chair to this free concert. Join the Historic Downtown District in the 100-200 Blocks of North Main for a street party with Music by Pepperland (songs of the Beatles), performing boogie, blues, swing & rock. This series continues the 3rdWednesday of the month through September. The Festival of the Little Hills is the Midwest’s Premier Arts and Craft Show. St. Charles&apos; largest festival of the year showcases more than 300 craft vendors, 50 not-for-profit organizations selling culinary delights, live music and entertainment, and the Kids Corner. Click here to read our blog post about the festival. The Canoe Race: 20-mile and 40-mile Missouri River canoe, kayak, and SUP race give paddlers the opportunity to actively promote clean water education, restoration, and recreation. The Bicycle Ride: Bicyclist enjoy a beautiful 35-mile ride over and alongside the MO River on the Katy Trail from Washington to St. Charles. The Festival (11 AM- 5 PM): Join Greenway Network and Bass Pro Outdoor Days at the finish line for great food, live music, and fun activities that highlight easy ways to encourage and enjoy healthy rivers. Plus great activities for kids to help them learn about streams and healthy options. There will also be artists & green vendors selling their creations. Sunrise Yoga on Beale Saturday, August 11, 8 AM-9 AM "All are welcome! Classes are accessible to those who are new to yoga, as well as experienced yogis." 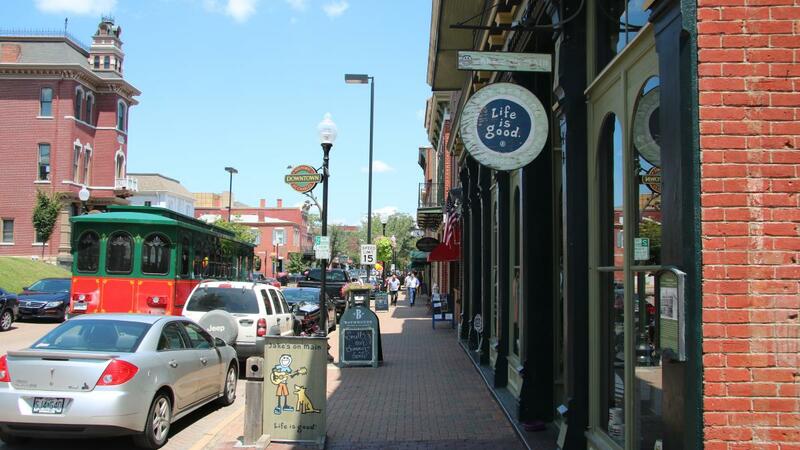 For more information about events at the Streets of St. Charles, click here. 14th Annual Healthy Living Senior Fair Tuesday, August 14, 10 AM-2 PM. Vendors, Health Resources, Senior Services, and more. Tickets: $25-$35 before July 31, $30-$40 after August 1st. Show Me Sweets – A Sweet Edible Art Show: September 8-9 Cake Battles, Vendors, Confectionery Classes & Demos, plus so much more. For more information about events at the Convention Center, click here. Current Exhibition: COLORLESS. Ends August 10 This all media exhibition invites artists to submit works based on their use of a “colorless” palette. Sometimes a monochrome palette can say more than a full spectrum of color and create a striking contrast. Artists are invited to share work that is composed of a majority of black, white, and all shades in between. Exhibition: Micro-Macro. August 17-September 28 (Opening Reception on Friday, August 17 from 5:30-8pm) For this exhibition, size matters. This show will display two opposites: one half focusing on small works (micro) and the other half focusing on works larger than 48 inches (macro). This exhibition is open to all two-dimensional and three-dimensional media and themes. Regional authors, poets, and artists, plus live music, interactive children’s museum, giveaways, and more. Storytime with Daniel Tiger -- pick-up your tickets at the Foundry. Concessions available. The Bubble Bus at 11 AM & Bobaloo performs at Noon. Decorated Sugar Cookie Classes: Join Jackie from SugarBot Sweet Shop at the Foundry Art Centre on the 1st Sunday of every month from 1-3pm to learn the basics of decorating beautiful sugar cookies with royal icing. This class is adult (18+) beginner level, $40 person, pre-registration is required. Themes: Aug. 5 – Back to School; Sept. 1 – Sweet September; Oct. 7 – Halloween! ; Nov. 4 – Fall Fun; Dec. 2 – Winter Wonderland. Call SugarBot to Book Your Spot – 314.961.9104. Spiro’s Thursday Lunches. Thursdays, 11:30 AM- 1:30 PM. $12 person – Spiro’s Catering presents delicious and authentic Greek cuisine. Exhibition: Out of the Woods: Celebrating Trees in Public Gardens WHEN: October 5-December 28. For more information about events at the Foundry Art Centre, click here. 2018-2019 Series – All season they’ll be celebrating TEN YEARS of entertainment, LIVE at Lindenwood University. For tickets and more information from Lindenwood&apos;s Scheidegger Center for the Arts, click here. Click here for tickets and more information about Lindenwood University Productions and music. For tickets and more information from the Family Arena&apos;s website, click here. Enjoy live music as you indulge in a variety of delicious food options available by different food truck vendors. Bring your lawn chair or blanket (some trucks cash only). Click here for more information about St. Charles Parks. First Responders Open House at the Pool: August 11 from Noon- 4 PM – All St. Charles First Responders & their families are welcome. DJ Tommy Tom will play your favorites & the Hot Dawg Cart will be available. Click here for more information about events in New Town. Traditional Music Day: August 18, 11 AM- 3 PM Learn about traditional music. If you are a folk music lover, you’ll love this free event. Fiddlers and other musicians are on site performing selections from today and various historical eras. Home School Day: August 29, 10 AM- 3 PM Reservations Recommended – tickets limited $5 each. Homeschool students & their families can experience pioneer life by exploring hands-on programs and demonstrations throughout the pioneer village. For more information about events at the Historic Daniel Boone Home, click here. August 16 “American Car and Foundry” Have you ever wondered why Main Street dead ends at Clark Street? Justin Watkins will present the history of the American Car and Foundry (AFC). Along the way, we will meet some of the most famous employees and learn about ACF&apos;s role in the St. Charles economy from its days as St. Charles Car Company up to World War II. September 20 “Slave Dwelling Project” Join members of the Slave Dwelling Project and the African American Genealogical Society to learn about their work in restoring, preserving and studying extant slave dwellings in the United States. Learn about identifying these properties and what you can do in your community to save them. October 18 “St. Charles County’s own Serial Killer” In 1940, Wentzville housewife Emma Hepperman was arrested for killing her husband, Tony Hepperman. Her husband of just over a month ingested arsenic. The investigation that resulted showed that Emma had killed at least five of her seven husbands, plus some more family members, mostly from eating her “famous” potato soup. Join Victoria Cosner, site administrator, to learn more about this fascinating and frightening piece of St. Charles history. For more information from the First Missouri State Capitol historic site, click here. St. Charles County Parks Family-Friendly Outdoor Movie Night – Enjoy a FREE movie (and popcorn) under the stars on August 10: Youth Activity Park at 8:30 PM - Heavyweights. Click here for more information. The Meadows at Lake St. Louis SummerFest Concert Series: Enjoy great music from 6-8pm at these free events, complete with Food Trucks -- August 23: Dance Floor Riot Plus Visit the Farmers & Artist Market at the Meadow each Saturday from 8 AM ‘til Noon until Nov. 3. O’Fallon Food Truck Frenzy: Friday, August 3 * 5:30pm-8:30 PM at the O’Fallon Sports Park - Enjoy a variety of food truck options and live music by the pop group, Next. Legends & Lanterns, a “Spirited” journey through Halloween History: October 20-21 & 26-28.